The drought continued throughout September 2016. 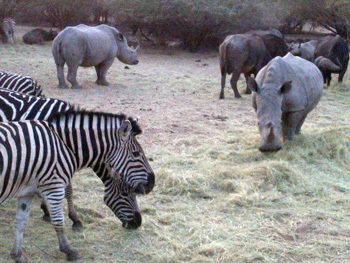 Unlike Kruger Park, some of the Private Game Reserves that Viva Safaris visit have decided to feed the animals. 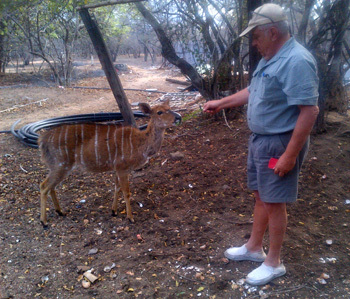 Both Kapama Game Reserve and Tshukudu Game Reserve have been feeding their grazers on a daily basis. on Lucerne at Kapama Game Reserve. In Kruger I am told that hippos and buffalos are being culled. The meat is being supplied to the local communities nearby. It makes sense to do this as there were so many carcasses lying around that tourists and tourist guides were becoming somewhat depressed. September was a hot month, about 36C and sightings were good. At Nsemani dam three lionesses and one lion were chasing impalas. White Rhino near Orpen gate and Buffaloes at Orpen pan close to the shop. Elephant sightings all over. Honey badger after Bobejaankrans. On the 7th we had a good day: Two Leopards at the first gate; Rhino bull before reception; Elephants at the Orpen pan; Buffaloes at the pan as well. Three Cheetahs before S106 Rabelais road, Elephants at Nsemani dam. Lions on S100. 17th: Two Rhino at the first gate, Elephants, Buffaloes drinking at Orpen waterhole. Lions 14 km along the S100 and Wild Dogs before Girivana. 24th: We spotted lions on the S100 as well as elephants. Great Rhino sighting at Sweni windmill and Buffaloes at Orpen pan, some Leopard on the S39. 27th: 2 lions spotted on Timbavati riverbed, Leopard on the H7, Lions on the S100 and Rhino on Orpen road. Elephants on Timbavati and more Buffaloes at Sweni Windmill. 28th: At Sweni Windmill we spotted 13 lions. At the T-junction on the S12 we spotted a mating pair of lions and Rhino on the H7. At Nsemani dam we spotted lots of elephants and buffalo. On the Bush Walks we always see hippo and crocodile out of the water. A herd of bull elephants are permanently found along the river. Sunset Drives have been great with regular sightings of a herd of elephants near the Spruit on Rome 1 usually near to a big herd of buffalo. 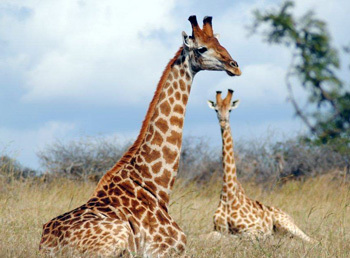 Giraffes, kudus and impala – all browsers – are seen all over. 2 lioness and 1 big lion have been frequenting the Olifants road. On the same road, we are regularly seeing a cheetah near the fence. Rhino have been scarce although we had a few sightings of 2 black rhino not far from Tremisana. On a Sundowner drive we saw 1 young male leopard on Rome 1 carefully keeping an eye on a fast-approaching herd of 20 elephants by the Spruit. We also got on a Bush Walk one big male leopard. This September has been good for us even though we are experiencing a change of season whereby it’s getting very hot recently. When we enter Kruger the first entrance gate is about 7 km from the second gate at Orpen. This is very productive when it comes to sightings – we often find rhinos and leopard. Looking at the number of leopards we got this month it was almost every day because the vegetation is very low – not dense – so they can’t really hide. We found one female leopard near Orpen gate stalking some Impala as we were on our way out. We enjoyed the sighting with the sun setting. The leopard stalked until it was only a few metres from the impala and tried to close down but it missed them – I think it was inexperienced. Driving along the S125 we found a hyena foraging under a tree. 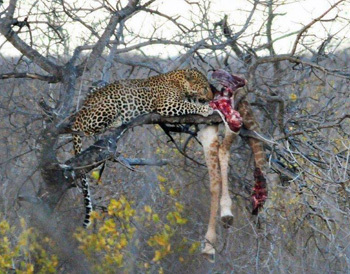 After a few minutes we spotted a leopard on top of the very same tree feeding on an impala that it had killed. The guests were very surprised by the sound of the hyena crushing the leg of an impala which fell on the ground. A few minutes later another leopard appeared from the bushes and lay next to the tree without even concentrating on the hyena. Leopard feeding on a Giraffe. The struggle of hippos in Kruger Park still continues in terms of grass – nutritional crisis is still a big problem and most of the time the lions don’t even scavenge on a dead hippo because of the amount of dead hippos. 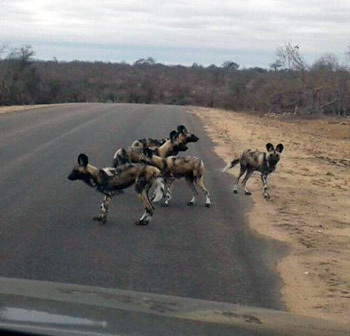 On our way out, we managed to get Wild Dogs – a pack of 10 on the Talamati road. A pride of lions near the water hole next to Bobbejaankrans has been spotted often recently, with their cubs they normally ambush impala mostly coming to drink water and recently killed impala in the afternoon where we found them feeding with the cubs next to the road. Despite the temporary drought that we continue to experience at Balule Nature Reserve a little bit of rain has brought about a small change in the area. Wildlife has become active again showing life in the environment. The Olifants River still gives life to animals including hippopotamus, crocodiles, elephants, giraffes and other antelopes. The regular sightings on bush walks of a female black rhino and a calf have been great. A massive beautiful male leopard frequents the spruit. Amazingly enough on the same night we managed to see this male leopard we also saw a female leopard on Marula road. The continued sightings of the cheetah alongside the Van Der Merwe fence has a wow effect on our guests. Vegetation that gives new leaves shoots and flowers attracts giraffes even closer to the lodge Tremisana. 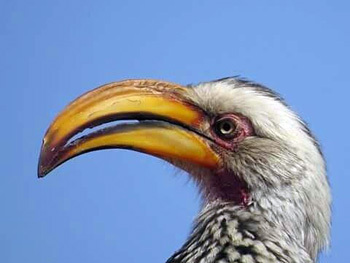 The rain drizzle that took place in the Kruger National Park some few days ago is bringing good results such that the sightings in the central part are picking up. Sightings of white rhinos at Orpen camp road, buffaloes and lions at Nsemani dam as well as the S100. This time around no need to drive all the way down to Kumana and Mazithi dam for better animal sightings. South of Satara the S125 has produced good sightings : a leopard killed an impala and hyena feeding on the ground. So amazing and a great scoop for our guests. Towards Talamati a leopard was seen some six metres on the roadside marking its territory. 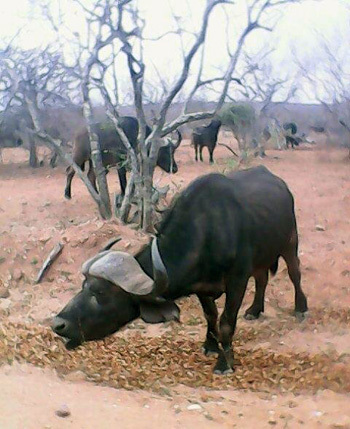 Buffaloes continue to feed from the shrubs as grass is not there. The side effects could come with lots of tannin in the stomach of these animals. Nature has got its own way of handling odd situations that befall the game. Sad to note that hippopotami continue to die along the S100 as a result of the lack of food and continued forced drinking from the stagnant dead water. Afternoon drives this month resulted in the sighting of 3 female lionesses along the Olifants River. They were fat-bellied, having just eaten. We have also been seeing a herd of about 40 buffalo. On all Sunrise drives we are seeing a female Cheetah walking along the fence line. Kruger trips this month have been amazing: Big Five every time and seeing stuff I never thought I would!!! We got lions chasing giraffe, cheetah chasing impala… lions eating buffalo, hippos and to top it off we got a first for me…lions mating!!!! Unfortunately, we also saw the negative side of this drought, seeing several hippos dead or busy dying as well as buffalos. But nature is an amazing thing and I am sure that everything will turn out good and even better than before. As winter comes to an end and we wait for rain, the first signs of the changing season are here. The Sjambok pod is a bright green and budding, showing off its beautiful yellow flowers. In the past weeks on bush walks and at dinner I have noticed some of our smaller crawling friends come out to play as well as the appearance of a snake or two. Kumana dam has dried up but filled again when the area got rain a few weeks ago. I have experienced a few sightings this month that really wowed me! First we got news of a leopard near the entrance gate and upon arrival found that she was stalking a group of impala in clear view from the tar road. She failed but it was still amazing to see!! On a different tour we found Wild Dogs, 4 adults and 6 pups!! This was unbelievable as they are highly endangered and personally I haven’t seen them in about 2 years!! The next week I found them twice more but they were far away. This has been the highlight of my month! The Talamati Wild Dog pack. This has also been the month for birding having seen a juvenile Brown Hooded Kingfisher, Pied Kingfisher, Comb Duck, Southern Ground Hornbill, Lesser Striped Swallow, Purple Roller, Woolly Necked Stork and more. 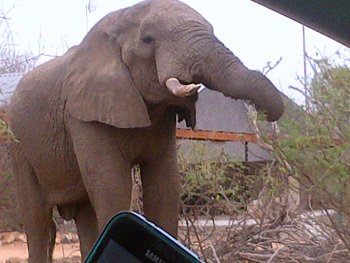 Tremisana game lodge provided some good drives, with some great elephant and buffalo sightings. The bush is as dry as I have ever seen it. 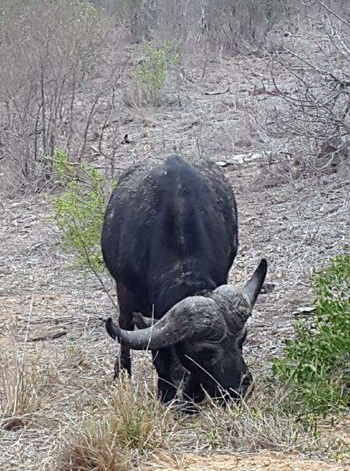 The bigger animals such as elephants and buffalo have been spotted moving towards the riverine areas to drink, and find some greenery to feed on. The lions were seen last right at Tremisana Lodge, feeding on a buffalo. We had a small bachelor herd of older buffalo bulls, hanging out at the back of the lodge. This was just too tempting for the local pride of lions, who late in the night decided to chase one of them down. Our guests that day were fortunate to get some great pics of lions up close. Had memorable sighting of a cheetah during a sunset drive, we were lucky to catch it on the move just off the road. It stood for a moment looked around at us, then kept on moving off into the bush. I have been moved to Marc’s Treehouse Lodge where we have had a few great bush walks. The close up giraffe sightings have been great – you really get to experience their gigantic height. The buffalo have also been spotted close by, often in the late evening heading down towards the river. I was incredibly lucky to see a leopard just outside the fence of Marc’s – we’ve had a few leopard sightings between Katekani Tented Lodge and Marc’s Treehouses Lodge- it is good to see the population is doing well in the area. KATEKANI TENTED LODGE now boasts 6 units accommodating 12 guests. We still have foundations for 2 more units but we are not going to do anything this year. The reviews so far are all 5 star – I hope that we get a 4 star one soon as it looks almost too good to be true! TREMISANA GAME LODGE has been extremely busy. We are pleased that both our boreholes have been strong – our Warden’s borehole situated on the same property has packed up and we are now helping him and the Black Mambas (all female anti-poaching squad). The game viewing has been excellent and we had 2 lion kills on both our properties within 6 hours of each other. The pride of 9 killed a buffalo 40 metres from Tremisana and a different pride (2 males) killed another buffalo only 20 metres from the toilet at Marula Boma. I understand from Christopher who conducted a sleep out the following night that the audio effects were unbelievably good – lions growling and a pack of 8 hyenas whooping away all night long! Wow! Christopher has recommended that we build a platform as the number of hyena are steadily increasing. MARC’S TREEHOUSE LODGE has had some great visits of leopard, rhino and buffalo this month. The Nyalas are doing alright and are feeding mainly on fallen leaves. September was quite a windy month so there was plenty of food. a leafy treat from my hand..
We welcome Joanne Rust as our new receptionist. She comes all the way from Cape Town. She is a friend of the owners of African Budget Safaris who are our biggest supportive travel agency. 5 star Ezulwini River lodge and we are expecting an already extremely high standard to be equalled or bettered!!! There have also been some changes in our guiding staff as well – more about that in next newsletter. Luke Ovendale now acts as Supervisor at all three lodges – thanks Luke for taking over some of my responsibilities! I enjoyed an excellent 3 night stay at Marc’s Treehouse Lodge as part of my Kruger visit with Viva Safaris. The rooms and facilities are comfortable, the atmosphere very relaxed and the staff are all friendly and helpful. My room had an amazing view overlooking the river and I was fortunate enough to have a fish eagle land in the tree which my balcony overlooked. Nyala antelope and Vervet monkeys are common around the lodge and a group of banded mongoose also visited one morning. 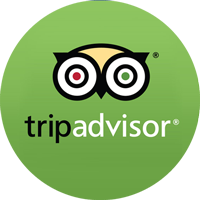 Everything was perfect and the service level was much higher than we expected. We spent 5 nights at the beautiful Tremisana lodge and we meet only friendly people, great staff, got great food and relax in a perfect garden. Rangers are superb and funny, we enjoyed every single moment there, morning bush walking, morning game drive, afternoon/sunset game drive, night drive. I can’t be thankfull enough what we experienced there. We had a wonderful stay at the Katekani Tented lodge; what I would call a “Boutique lodge”. The rooms were beautiful, the beds comfortable and really private. (At the time we stayed, there were only 4 rooms on the premises!) By the way, in this particular case the word “tented” means that some of the walls of the room are made of sturdy tent materials partially made of screen but you can totally close off the screened sections for more privacy. The food was excellent and the staff was really attentive. The safari drives were amazing too and the guides very knowledgeable. I highly recommend choosing Katekani. You just can’t go wrong!